One of the biggest tricks in finding a very good pair of noise cancelling headphones is to restrict your choices to products priced at least $200 or above. Sure there are some great pairs of headphones that are more affordable and boast the ability to reduce ambient noise but nothing compares to spending more on products with actual noise cancelling technologies. Noise cancelling is the premium you are paying for anyway and this explains why simple looking products like the AKG N60 cost $249. Unlike some of the cheaper AKG products that have some fun designs, the AKG N60 is a more serious approach to design and it looks very good. It took on the on-ear approach which means that you can’t passively rely on the AKG N60 if you want to isolate yourself from the unwanted noise. You have to trigger the active noise-cancelling mode to really get a feel of what this pair of headphones is capable of doing. You don’t have to worry about batteries either because the AKG N60 is rechargeable and a USB cable is included in the package. Also included in the packaging is a carrying neoprene pouch, 3.5mm detachable cable and flight adapter. This cable adopts the one-button system so it is ready for hands-free calling with smartphones. The ear cups are covered in a soft leather material and feel really great. Weighing less than 200 grams, is the kind of headphones you can wear for extended periods too. Not everyone is comfortable with on-ear headphones though so over-ear noise cancelling headphones still have a comfort advantage. 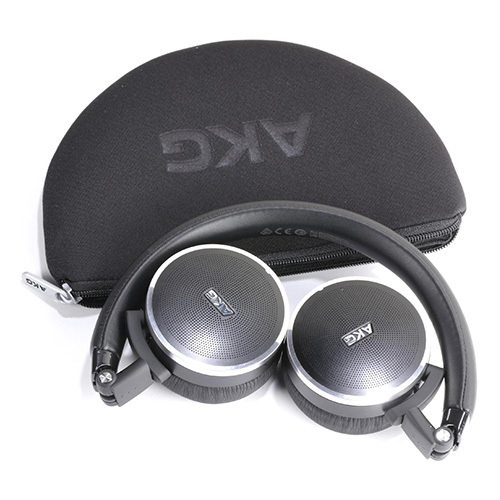 However, compared to other on-ear headphones, the AKG N60 ranks pretty high on the comfort scale. AKG wanted to make it clear that the AKG N60 is meant for traveling and even includes it in their advertising. Because of how light these headphones feel, traveling with the AKG N60 is simply no problem and are very easy to collapse to a more compact profile. The noise cancelling performance isn’t the best amongst the large pool of noise-cancelling headphones but it is good enough to justify its price. As mentioned earlier, you really have to turn on the active noise-cancelling mode because the ambient noise creeps in when disabled. With noise-cancelling mode enabled, a fully charged battery will last about 30 hours before you need to recharge using the USB cable. Audio quality is good enough for the AKG N60 to handle all sorts of music. Mainstream pop and R&B music really stand out with strong vocals, excellent midrange and a good dose of bass. The AKG N60 is the kind of product that isn’t really perfect in anything but it has no serious weaknesses. It is smartly designed and highly portable with balanced audio and solid noise cancellation. The battery life is reasonable and while it doesn’t rely on a standard micro-USB cable for charging, the AKG N60 is rechargeable nevertheless so the noise cancelling fun should never end. The AKG N60 is all about the noise cancelling anyway and it meets the goal of being great at what it needs to do.